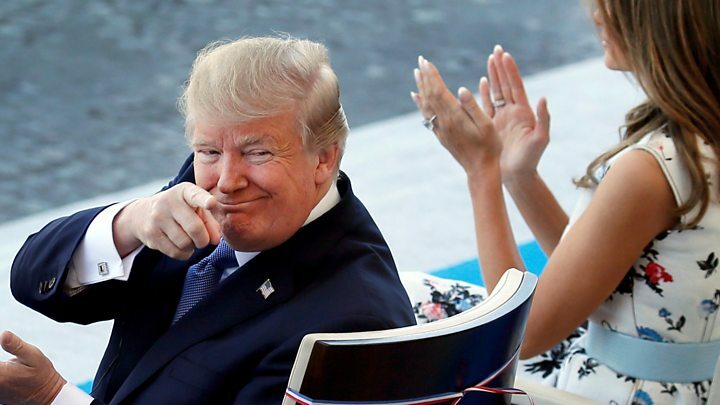 President Donald Trump has applauded the Bastille Day parade in Paris, where US and French troops marched together down the Champs-Élysées. He was guest of honour as the annual parade this time marked 100 years since the Americans entered World War One. 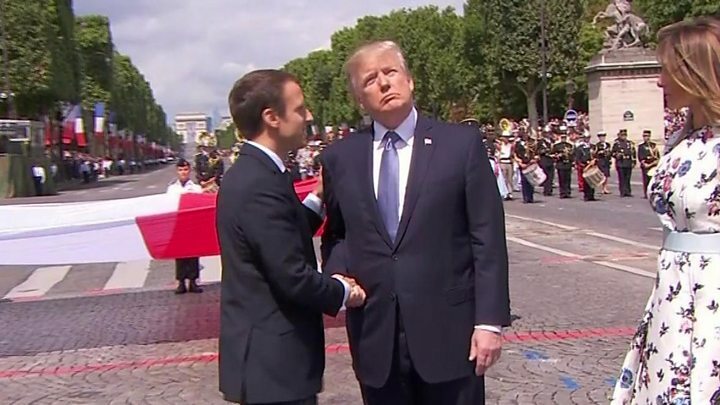 French President Emmanuel Macron said "nothing will ever separate" France and the US, and Mr Trump's presence showed "a friendship across the ages". Earlier Mr Macron stood in a military jeep and inspected the troops. He is now in Nice, attending a commemoration for last year's Bastille Day terrorist attack, in which a Tunisian-born man drove a huge lorry into a celebrating crowd on the beachfront, killing 86 people. At the start of the ceremony people were honoured for their heroism on the night. They included Franck Terrier, the man who drove his scooter alongside the speeding lorry and jumped on to its cab, punching the driver through the window in a desperate attempt to force him to stop. Mr Terrier was given a lengthy ovation and awarded the Légion d'honneur - France's highest order of merit. In Paris earlier, President Trump and First Lady Melania warmly embraced their French counterparts - Mr Macron and his wife Brigitte. Mr Trump called Bastille Day "a wonderful national celebration". "Our two nations are forever joined together by the spirit of revolution and the fight for freedom," he said. Earlier, he suggested he could review his position on climate change, after Mr Macron argued in defence of the 2015 Paris accord. "Something could happen with respect to the Paris accord," Mr Trump said. "We'll see what happens." Last month he had said the US would withdraw from the Paris accord, citing moves to negotiate a new "fair" deal that would not disadvantage US businesses. On Thursday, Melania Trump toured Notre Dame cathedral with Brigitte Macron, and prayed before a statue of the Virgin Mary.